I was sitting around work and my hands had the urge to create something. 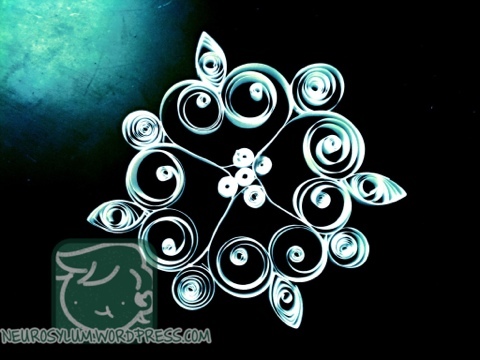 I was browsing through teh internetz and stumbled upon quilling1. According to Wikipedia, quilling has been around the Renaissance and used in religious art, mostly on books, serving as an imitation to ironwork at the time. If you search for images of quilling, especially quilled snowflakes, you’ll find a lot of detailed work. That was enough to inspire me to try it. You really need to be very bored and have lots of patience. It took me 45 min to do and I might have had more control over how the shapes came out if I didn’t use our flimsy printer paper. Quilling is a neat craft to help express my swirly-loopy urges I get from time to time.